I believe these techniques are important enough that they need a name: Reactive Web Design. In summary, reactive web design is a set of techniques that can be used to build sites that always feel fast and responsive to user input regardless of the network speed or latency. As web developers and framework authors, I believe finding ways to make these patterns default in everything we build is a top priority for improving UX and perceived performance on the web. When used well, this technique is almost never noticed, but has a huge impact on perceived performance of a site. Interestingly, the technique is used by almost all native apps and makes them feel very reactive even on terrible networks, but it is almost never used on the web! In short, skeleton screens ensure that whenever the user taps any button or link, the page reacts immediately by transitioning the user to that new page and then loading in content to that page as the content becomes available. When this technique is used best, content that is already available such as thumbnails or article titles can be re-used to improve the perceived performance even further, making loads feel truly instant. Testing how well sites use this technique is easy: simply use Chrome network emulation to make the network as slow as possible and then click around a site. If it is doing this well, the site will still feel snappy and responsive to your input. You know that feeling where a website is jumping around while you’re trying to use it? You’re just trying to read an article and the text keeps moving around? That’s what we call an “unstable load”, and we need to burn it with fire 🔥🔥🔥. slate.com content jumps around very aggressively as the page loads. The slower the network you’re on, the longer it jumps for. Unstable loads make websites hard to interact with, and makes them feel… well… Unstable! Unstable loads are caused by images and ads embedded into a page but not including any sizing information. 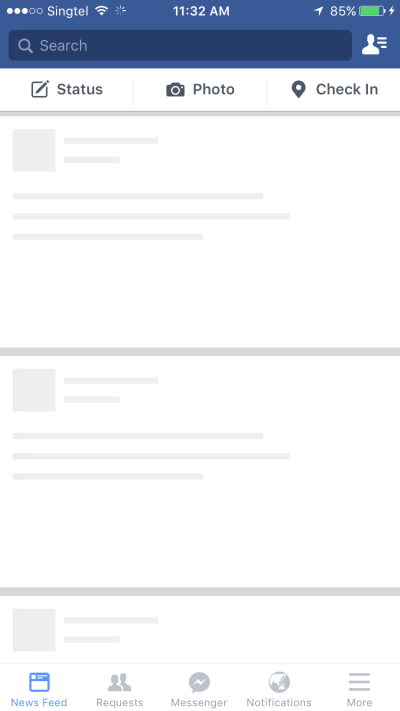 By default the browser only knows the size of these once they have loaded, so as soon as an image loads in, THUNK!, the whole page slides down 😡. To prevent this, all <img> tags on a page must proactively include the dimensions of the image they will contain. In many cases images used on certain pages are always the same size and so their size can simply be included in the HTML template, but in some cases the size of images is dynamic and thus their size should be calculated when the image is uploaded then templated into the HTML when it is created. The same is true for ads, often a culprit when it comes to unstable loads. Wherever possible, create a div that will contain an ad, and in your templating set it to be sized with your best guess at how big this ad will be. Note that unstable loads are at their worst on slow networks as you have just settled into reading content when suddenly it jumps, and you can never quite be sure that you’re safe. I’ve build a small demo site at reactive.surge.sh to demonstrate the difference between conventional and reactive web design. Note how sluggish it feels and how frustrating content jumping is. Interestingly I find this orders of magnitude more annoying on mobile devices when tapping the screen and not seeing it react. The slower the network is, the worse the user experience becomes when page transitions block on the network and pages jump around for extended periods. With Reactive Web Design we can make our experience feel snappy and responsive (“Responsive Design” as a name was already taken, d’oh!) even on slow and painful networks. I’d love to hear about data from the community on the effect of perceived performance on KPIs such as engagement and revenue! Additionally, I’d encourage framework and library authors to consider how to make skeleton screens and stable loads the default, also known as the pit of success. If you have thoughts about this, please tweet me @owencm, and if you enjoyed this please give it a ♥! P.S. be sure to check out the demo site reactive.surge.sh on a mobile device for it’s full glory!